The largest wildfire in Greenland‘s history burned bright last summer, a potential warning sign for a future rattled by catastrophic climate change. Scientists are concerned that Greenland’s massive ice sheet may absorb the black carbon smog produced by the fires, as well as by any fires that occur in the future. One-third of the ice sheet has been affected by the soot from the wildfire, which accelerates heat absorption and glacial melting. “I think it’s a warning sign that something like this can happen on permafrost that was supposed to be melting at the end of the century,” rather than the present, Andreas Stohl, senior scientist at the Norwegian Institute for Air Research (NILU), told Live Science. The fire burned about 90 miles northeast of Sisimiut, Greenland’s second largest city, and some suspect it was started by human activity. However, it is possible for peat in oxygen-rich conditions to spontaneously combust, even when temperatures are low. In total, the wildfire burned about nine square miles of land. Of particular interest to scientists at NILU was the impact that soot might have as it landed on the ice sheets. “If you consider that Greenland has the largest ice sheet, apart from Antarctica, it immediately triggers some thinking,” NILU scientist Nikolaos Evangeliou told Live Science. Computer modeling enabled the NILU team to determine that seven tons of black carbon, approximately 30 percent of the total emissions produced by the fire, landed on the ice sheet. Ultimately, this amount of soot had a relatively small impact, less so even than that of North American wildfires that deposited soot across the sea to Greenland. Nonetheless, the fire may forecast larger ones in Greenland’s future. “If larger fires would burn, they would actually have a substantial impact on melting,” explained Stohl. Fires in Greenland potentially can also continue burning underground even when the surface fires have abated. “We cannot actually be sure that the fires (in Greenland) are out,” said Stohl. 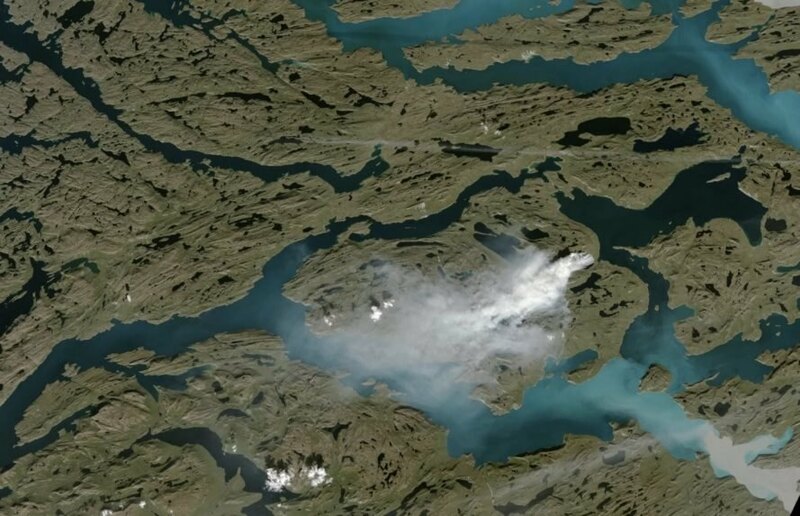 A close-up image of Greenland's largest-ever wildfire. Though relatively small in contrast to wildfires elsewhere, the largest-ever wildfire in Greenland is an ominous sign of climate change this century.